China Protests Emergency Landing Of U.S. 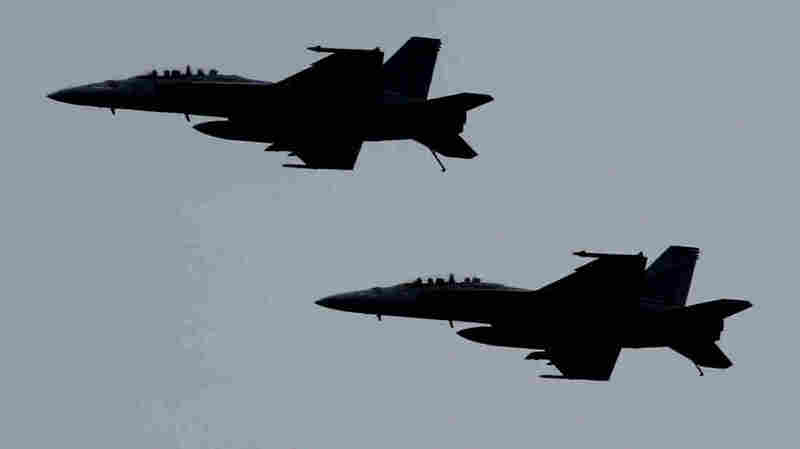 Warplanes In Taiwan : The Two-Way Two Navy F-18s landed at an airbase on the island, which Beijing considers part of its sovereign territory. U.S. F-18 fighter jets fly over the Nimitz-class aircraft carrier USS Abraham Lincoln (CVN 72) during fly exercises in the Persian Gulf. A pair of this same type of aircraft landed in Taiwan, reportedly with mechanical problems. China is strongly protesting the apparent emergency landing of two U.S. Navy F-18 fighters at an airbase in Taiwan — the first time such an incident has occurred in three decades. Beijing has long considered Taiwan part of its territory and the presence of U.S. warplanes there has caused unease. "We have already made solemn representations to the U.S. side," China's Foreign Ministry spokeswoman, Hua Chunying, told a regular news briefing. "We require the U.S. to abide by the 'One-China Policy' ... to prudently deal with the relevant issue," Hua added. Media in Taiwan have portrayed the incident as a first since the mid-1980s. Taiwanese military expert Lin Yu-fang, who is also a member of parliament with the ruling Kuomintang party, was quoted by Agence France-Presse as saying the two jets were escorting an EA-6B Prowler, an electronics warfare aircraft, en route to the Philippines. "Taiwan must have been considered by the United States a trusted place to make the emergency landing," Lin told AFP. "U.S. weapons sales in recent years to Taiwan, or indeed any formal contact between the two armed forces, have provoked strong condemnation by China, but have not caused lasting damage to Beijing's relations with either Washington or Taipei. "China views Taiwan as a renegade province and has not ruled out the use of force to bring it under its control. "While Taiwan and China have signed a series of landmark trade and economic agreements since 2008, political and military suspicions still run deep, especially in democratic Taiwan, where many fear China's true intentions."